The Signal: How does it feel to go to the real GSU after graduating from the fake MHS? Lewis: [laughs] Oh wow, the fake MHS. I’m not sure what that exactly means. The Signal: There are two MHS’ in Cobb County. Marietta High School and McEachern High School. One of them is real and the other isn’t. Lewis: Oh, McEachern is real, that’s definitely the real MHS. McEachern, no brainer. The Signal: What was it like to learn from someone like Te’a Cooper? Lewis: I think that was a great experience for me. I played around a lot of great players, besides Te’a. I played with Caliya Robinson at UGA, Taylor Gordon who went on to Wake Forest. But I just learned as much as possible, stayed in the gym with her. She taught me how to be a great leader, she taught me how to score and how to be a great player. The Signal: Was it weird on campus after she [Cooper] was on MTV [True Life: I’m Being Recruited]? Lewis: I wouldn’t say it was weird because people expected it of her. I’d definitely say that people were excited for her, though. The Signal: For people that have never seen Jada Lewis play, how would you describe your game? Lewis: Tenacious. I just like to play hard, leave everything on the court and give everything I have. A lot of people have doubted me all my life and they continue to doubt me. So I’m just ready to show the world. The Signal: Coming from one of the top national high school programs and being one of the top recruits coming out of the Class of 2016, why’d you choose Georgia State? Lewis: I chose Georgia State because I felt like the coaches really meant it when they told me they could get me to the next level. My dream is to play professionally and even though I had other offers and other places that I could’ve went, I felt like, my relationship with Coach B [Baldwin-Tener] and Coach Erin, it was different from everything else. The main thing for me was making sure I came to the right school to get me to the next level. I felt like Georgia State was that choice. The Signal: Coach Erin and all of the assistant coaches seem to be really personable with all of their players. What is one of your favorite moments with your coaches? Lewis: One of my favorite moments, I would say with Coach Erin, was right before I shot two free throws in the Kennesaw State game. She told me that “I was going to be somebody” and that “I didn’t want it any other way.” I didn’t want it any other way. I wanted the pressure on my shoulders. I wanted to give my team the W or put us in a position where we would have a better chance to win. So that moment meant a lot to me. The Signal: Why do you want the pressure on your shoulders? Lewis: I think in order to be a great player, you have to rise above in moments like that. So when God presents the opportunity for me to do so, I feel like that’s my chance to rise above and that’s my chance to show people that I can do it too. The Signal: How has the transition been from high school to college? Lewis: I would say the game is a little bit faster. Just being smarter, making better decisions, but other than that, I’m learning to settle into the game. I mean it’s just basketball, everybody puts their shoes on the same. The Signal: It seems like this team is very young and talented. How does it feel being a part of that new foundation in the next era of Georgia State Women’s Basketball? Lewis: I think it’s exciting because I don’t think people know what we really can do. I don’t think we know what we can do yet. It’s exciting because we’re going to grow and I think this year, we’re going to show everybody that we can be a great team. I think we just have to keep working hard, learn to bond, stay together and make that translation on the court. Lewis: [Laughs] I don’t really dance, but if I’d have to choose I’d say the cha-cha slide. The Signal: What does Jada Lewis do in her free time? Lewis: Go to the gym. When I’m prohibited to go to the gym, I watch Christmas movies. The Signal: Christmas movies in July? Lewis: In July I’m probably training pretty hard, so around this time right now, since we’re in-season, I can’t go to the gym as much as I want to. Coach B wants me to rest, so I watch Christmas movies or I’m with my roommate [Panthers Center Shaquanda Miller-McCray] Shaq. The Signal: Favorite Christmas movie? The Signal: Speaking of Shaq and Jaylyn [Harrison], how have you bonded with the other freshman? Lewis: Our bond is pretty cool. We’re in class together, we have every single class together, so we’re together all day, every single day. We have study hall together. Shaq is my roommate, so we’re really together all day and we’re like best friends. Jaylyn and I just have a connection on the court. We both have high energy, we’re both excited to be here. 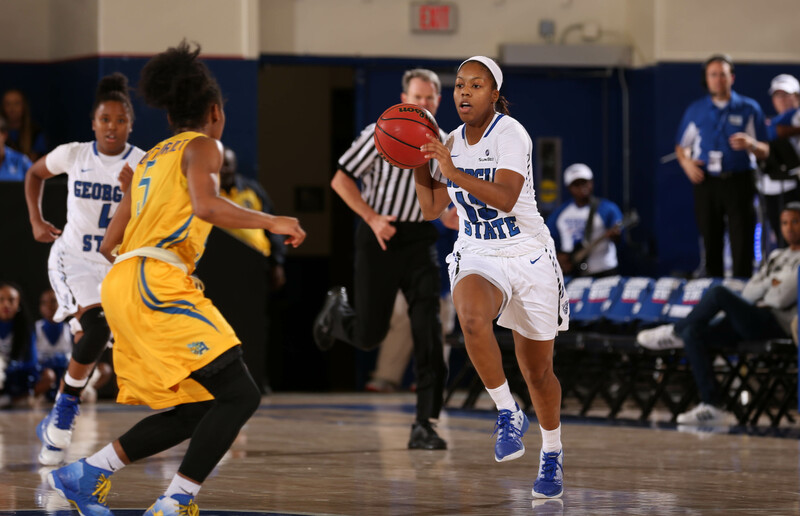 The Signal: Other than going pro, before leaving Georgia State Jada Lewis wants to do what? Lewis: Before leaving Georgia State, I just want to make my mark. I want people to remember me for something good. I just want to make sure while I’m here I use my time to the fullest and just go all out and do everything I set out to do. Be the best that I can be here. Lewis: Oh, that’s my guy. The Signal: Have you been keeping up with the men’s basketball team this year? Lewis: Yes. I actually go to the men’s basketball team, specifically, to watch D’Marcus. He reminds me of myself.I think we both play with an edge, we both have something to prove, because a lot of people, they doubt us. I love D’Marcus game, so I watch him a lot. The Signal: It seems like both of you have a big fan base at home, but both of you say that you have a lot of people doubting you. Do you see 50 people that support you and one person that doesn’t, but that one person stands out more than the 50? Lewis: I wouldn’t say it’s just one person. There’s a lot of people out there. When I was in high school, I didn’t get recognized. It was probably my junior year when ESPN ranked me and all this other- and although that stuff doesn’t matter, you just know how hard you work and you might see people that just count you out. That’s another reason why I choose Georgia State because I really think we can put this school on the map, so they can stop counting us out.